EDITOR’S NOTE: This is part two in a two-part series on Native American Heritage Month and the history of Native Americans in this area. MIAMI COUNTY — Native Americans continued to have a presence in the Miami Valley after the historical trading village of Pickawillany dissipated after an attack, although their presence waned throughout the 1800s as the American government worked to expand their territory and remove Native Americans from that territory. One of Miami County’s well-known historical figures, Col. John Johnston, started to come into the picture in 1794, according to Andy Hite, site manager of the Johnston Farm and Indian Agency. Johnston’s career of working with Native Americans began when he was driving supply wagons for Gen. Anthony Wayne’s legion as they were moving north. After the Battle of Fallen Timbers occurred and the Greenville Treaty was signed, Johnston returned to Philadelphia and got a job in the war department. In 1802, Johnston returned to work as a agent between local Native Americans and the American government, representing the American government when negotiating with Native Americans and representing Native Americans when negotiating with the American government. “He eventually gets appointed to the Indian Agency in Fort Wayne,” Hite said. Hite said that Johnston had married his wife Rachel by that point, whom Hite said helped Johnston become better at his job as an Indian agent. Hite said that Johnston served in a variety of capacities in Fort Wayne before he transferred to the Indian Agency in Piqua after it was established in 1811. Johnston continued to negotiate between Native Americans and the American government, making sure that the agreements in treaties were carried out, such as annuities being paid to Native Americans. “He had the respect of both people,” Hite said. During the war of 1812, Johnston also had the job of working with Native Americans to keep them from taking a side between the Americans and the British. Americans were fighting the British on the east coast and they did not want to fight Native Americans on the west coast, Hite said. “One of the first things that he was charged with in the … summer of 1812 was to call a council here of the western tribes,” he said, explaining that Johnston orchestrated the Council of Piqua. Hite said that Johnston worked behind the scenes during this council and was not one of the main negotiators. After the War of 1812, Johnston continued to negotiate various treaties with Native Americans, including moving them farther west as the American government continued to get more territory and land. “He negotiated some treaties that shrunk that Indian land,” Hite said. Johnston also helped stand up for Native Americans, such as in 1826 in eastern Indiana in an area called Fall Creek when a group of white settlers, who “were not pleased with basically peaceful Indians camping out in their neighborhood,” got drunk and ambushed some of the Native Americans. This area was part of Johnston’s Indian Agency, so Johnston eventually had those involved in the ambush arrested and prosecuted. “They were found guilty, and they were executed,” Hite said. He said that this was the first time that white settlers were held responsible for mistreatment of Native Americans. 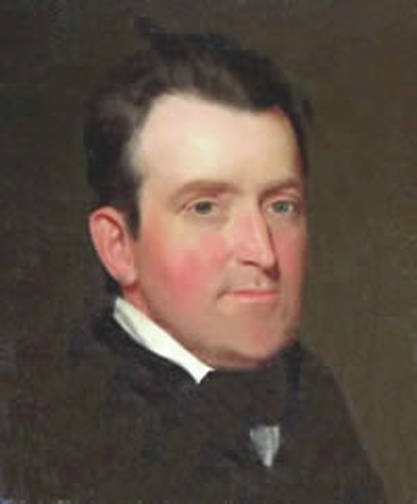 Johnston lost his position at the Indian Agency in 1829 due to political differences, as President Andrew Jackson was a Democrat and Johnston was a Whig. In 1842, though, Johnston was appointed to negotiate the Treaty of Sandusky, which removed the Wyandot Native Americans from Ohio. “The last Native American reservation in Ohio was around upper Sandusky … and that was a Wyandot reservation,” Hite said. Hite added that the removal of the Miami tribe from Peru, Indiana, passed through on the Miami-Erie Canal. “The Miami thought that they’d never be removed. They didn’t think they’d be pushed west,” he said. Hite said that they left on canal boats. “The Miami removal came right by this place in October of 1846. We saw the Miami exit here right past the Pickawillany village.” The Miami took scoops of the land with them during their removal so they could take their land with them, Hite said. Hite said that Johnston was “realistic of what was going to happen” in regard to the native population losing Ohio, but Johnston wanted the Native Americans to be treated as respectful as possible and that he did not want to see the Trail of Tears happen in Ohio. “The Native American people are a people with a past, but not a people from the past. They’re still here,” Hite said.